A mom post; not an art post! The boys in the band: Jeremy, Alex, Kevin, Ben, and Pat. This is my son's former high school band, Echoes. After just 2 days of practice, they got together to put on a reunion concert tonight, to benefit the fundraising efforts of the girlfriend of the guitarist on the far left. She is raising $4000 for the Boys and Girls Club in order to qualify to run the Boston Marathon. Go, Steph!!! Here's my Ben at the mic for Alaskan Blues. It's kind of a 'talking blues' since he is not a singer. And this young man at the mic is multi-talented, playing keyboard, cello, and guitar, and also doing vocals for the band. And the former Echoes vocalist and sax player at the mic in this photo joined the band tonight for their second set, after singing the national anthem at the hockey game. He is also a member of the a capella group the Dartmouth Aires, who you would have seen take second place if you watched the TV show The Sing-Off. So, along with other original Echoes songs, he additionally sang Pinball Wizard with the band (his group also performed that same song on The Sing-Off). I was very saddened to read this morning that artist James Rizzi has died at the young age of 61. We have Rizzi-themed artwork hanging all around my school right now, and I'm sure my students will be shocked by the news. Here's a link to a nicely written obituary. Goodbye, James, and lets hope that your heaven is filled with buildings that are smiling and happy, with symbols of peace and love and goodness everywhere. And maybe some beeping cars filled with laughing people, and congestion and bridges and skyscrapers to make you feel like you are in your beloved New York City. Rest in Peace, James. So, I went to the mall for something yesterday, and through the window of a little gift store I saw the most spectacularly gorgeous earrings I'd ever seen. I went in for a closer look with hopes of finding them with a post-Christmas sale price. They were $26, not on sale. The tag said 'handmade'. 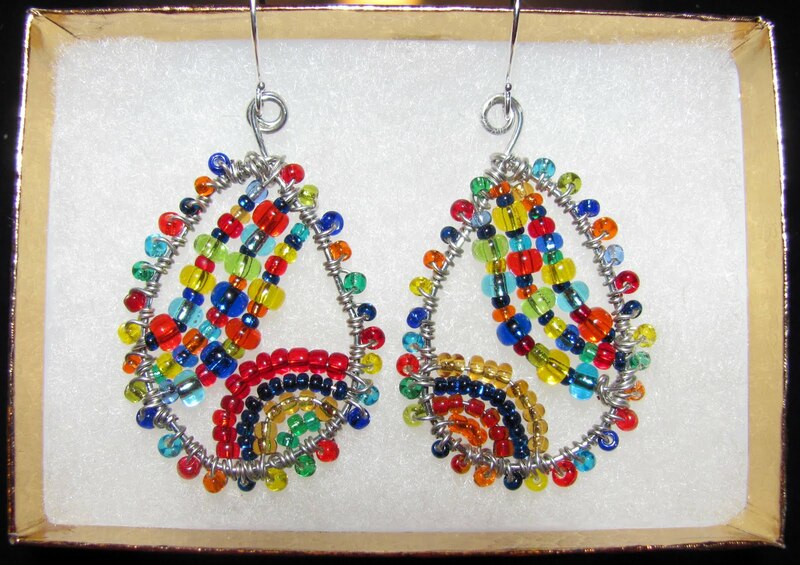 Still, the price seemed quite high since they were just made with simple base-metal wire and glass beads, no real silver or expensive gemstones. Since I make jewelry, I could not justify spending that amount of money on buying a pair of earrings (especially right after Christmas and Chanukah). So I tried to memorize them. I started counting the beads and the loops of wire, and the salesclerk at the counter started giving me suspicious looks. So I left, and when I got outside the store I stood out there in the mall trying to doodle them from memory on a little pad in my purse. I felt like a crime scene artist. 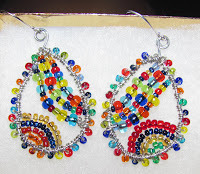 Last night I set out to re-create the earrings, but boy were they a challenge. In the end, my pair is a very simplified version of what I saw in the store, and I think the first earring took me about 3 hours to figure out. The second one was done in about 1/3 of the time. But even though they are not the gorgeous paisley of the store earrings, I'm pretty pleased with them! Here's another view of my creations. Meanwhile, we had the TV on, and needed to find something fun to watch while I worked with my beads and wire. Have you seen the movie Zombieland? I'm not usually the sort to watch zombie movies, and my husband is even less likely to, but this was a spoof, and had us laughing hysterically throughout the movie. 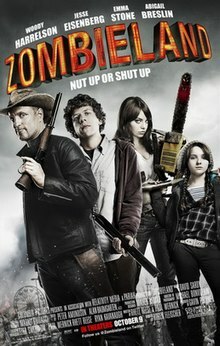 Once you get past the initial zombie gore, it is really funny, with a great cast: Jesse Eisenberg, Woody Harrelson, Emma Stone, Abigail Breslin (no, they are not zombies), and a fun celebrity cameo. Hey, if you can make it through the brutality of The Girl with the Dragon Tattoo, Zombieland will be a walk in the park! I highly recommend it. My friend Paul's annual Christmas "art project"
When I first met Paul, probably around 1980, he was doing "string art". You know, the stuff where you hammer in nails and wrap strings around to create designs. I tried not to pass judgment, because he was a good friend, but to me the "string art" was akin to painting on velvet. Shlock. This is a little Christmas village viewed in a window. But now cars line up in front of Paul's house every night during the winter holiday season, and both kids and adults get out to push buttons and make little displays light up, and figures move, and music play, and make donations that help the needy. These photos only show a tiny part of the whole display. You can push a button to make Santa's helicopter come to life on the roof, or view the work going on in Santa's Workshop, which is a little building with a viewing window. The HUGE tower pictured below has a changing color light show set to music every 15 minutes. Tonight when we drove over to visit, Paul was outside in the frigid temperatures (about 15 degrees) greeting kids and suggesting buttons for them to push and telling them to look up at a window in the house where suddenly an animatronic rock & roll Santa and his band began to play and sing. It's all pretty magical, even though we have no snow. And possibly a little insane, just like my dear old friend!!! My 3rd post of the night! Yee-ha!!! My camera's memory card was full so I'm cleaning it off. I didn't get a photo of the whole bulletin board (memory card full) but at least I got these pics. Above, two flapless pouches, and a bunch of kids with their just-finished pouches. See these three bags directly above? They are all made by boys, proving that real men do indeed wear pink!!! I totally forgot to photograph the trophy, after spending HOURS in my classroom after school constructing it, but the Jewish World newspaper published a few photos of the Latke Fest including this one with me and my trophy. You can't tell, but the latke is made with shredded paper and papier-mache paste. The frying pan is made from a dollar store tin plate and spatula, and the tilted pan has a puddle of "oil" that appears to be dripping over the edge. The oil is made from Pour-On, which is this amazing stuff that dries crystal clear and is self-leveling. Where did you all come from?! Thanks, readers, for keeping me on my toes. But now I want to pick YOUR brains for an idea I'm working on. I love making papier-mache cats and plan to make them (soon) with my 5th graders. We use a plastic grocery bag for the body, stuffed and taped to shape it. In the past I've used a simple ball of newspaper for the head, of course with ears added etc. Often we've used bottlecaps or styrofoam balls for goofy bugged-out eyes. BUT. This year, my last, I want to combine making papier-mache cats and introducing a favorite commercial artist: Laurel Burch. I have been a HUGE fan of her work since the 70's, when I got my first pair of her enameled cat earrings. Nowadays you are more likely to see her work as a scarf or a purse. Her fantastic felines are just gorgeous, and we are going to make them 3-dimensional in papier-mache. But I'm trying to sort out some glitches. The faces have a very distinctive shape and I plan to use it. No goofy eyeballs this time! Today I built a prototype with a shaped piece of cereal box cardboard over the newspaper ball, and it looks pretty good but I used up a LOT of tape just on the head and am worried I will use up all the tape in my room just building heads. 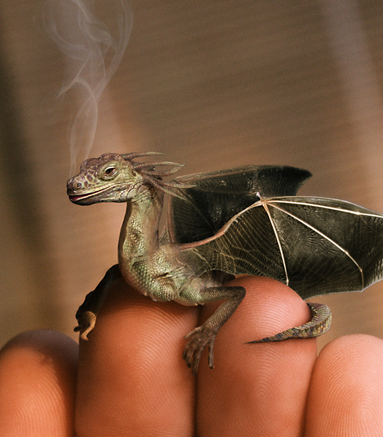 If anyone has any other idea for a material to use for the head armature, please let me know. The first woven pouches are complete and I couldn't wait for the rest to show them to you. Hopefully most of the others will be finished this week, before everyone leaves for vacation. 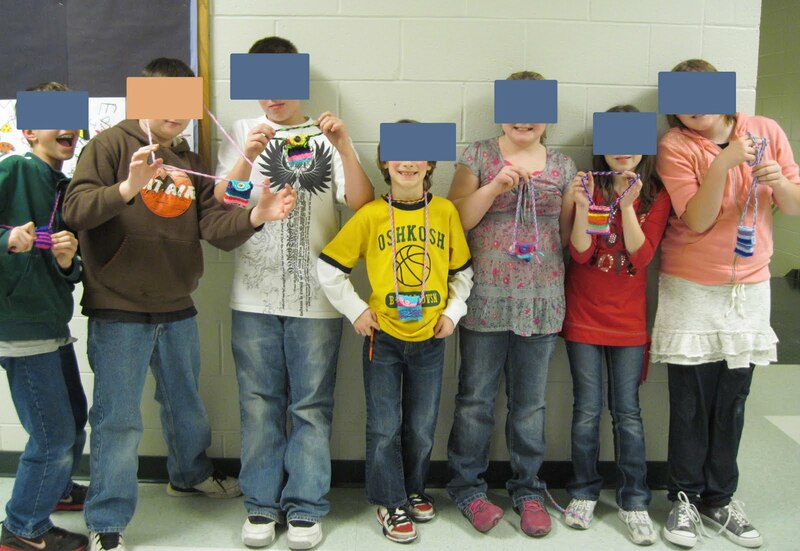 The kids did great on this project and are VERY proud of their weavings. Below is a pouch both open and closed to show you what it looks like. This is the process: we began with a hunk of a cereal box (3"x8") as a loom, and marked off 1/4" intervals on the two 3" lengths. We cut down 1/2" at the marks to make notches, or "teeth". The loom was warped by stringing the warp string up and back, going around each tab ("flossing the teeth"). Then the loom was folded in 1/2 to create the pouch, and a rubber band was put around it to secure the fold. Most kids opted to fold the looms unevenly, so that there would be a flap when complete. For extra security, a lot of the kids put a piece of tape over the teeth to keep the warp from slipping off before they started weaving. The weaving is done in a circular fashion until the flap is reached, and then it is a more traditional back and forth weave. The students use forks or combs to 'beat' down the yarn so that the weave is tightly packed, getting as close as possible to the top of the warp. When the weaving complete, the two ends of the warp string are knotted off, the warp strings are pulled off the teeth, and the loom is pulled out and discarded. Above is a whole class of work-in-progress, most nearing completion. Finally, the students use needles or crochet hooks to work through all the yarn ends and hide them in the weave. NOTE: This is a good project to enforce that "ask three before you ask me" rule. The kids who finish first will be very good teachers to the ones moving a little more slowly. 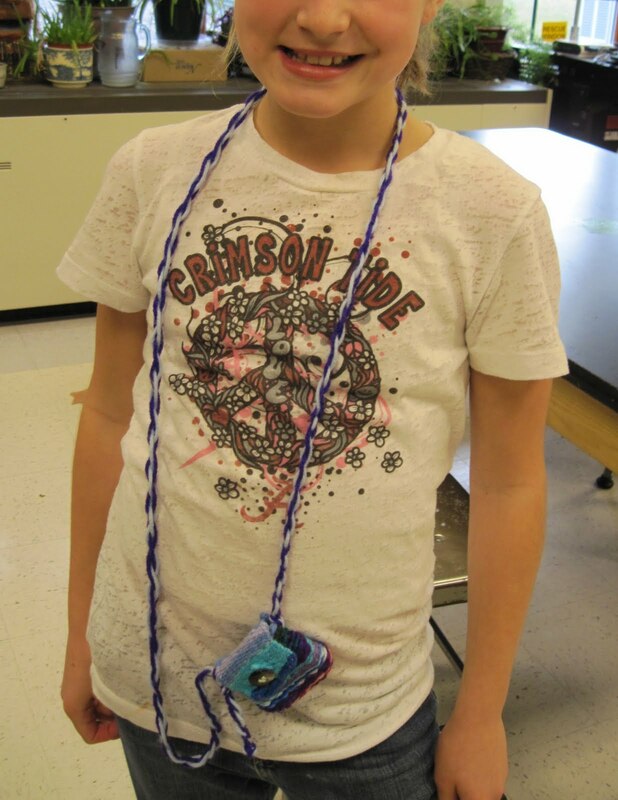 Many students sew a button on the front and make a rope strap. 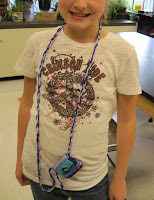 (Making a rope is MUCH faster than braiding or kumihimo). Cut 2 or 3 strands of yarn, each more than twice as long as the desired rope. Then have two students each take an end and start twisting the yarn, as tight as possible. DON'T LET GO!! When it's nice and tight, fold it in 1/2 grabbing the two ends together and knotting them. Let the rest go, and run your hand down it to smooth it out. Voila! Twisted rope!! We use the loop on the folded end to pass through the weaving and pull the rest of the rope through. The other end needs to be either sewn or knotted through the weaving. My assistant superintendent observed my class the day we did the human weaving and began the actual weaving. She was thrilled with how the lesson went, and loved that my students knew so much vocabulary - all the "W" words of course: weave, warp, weft (or woorf); and the others: loom, opposite, and beater. I hope who ever replaces me next year will keep the kids weaving annually. Grade 4's Rizzi style Silly City! Our 4th grade James Rizzi mural is complete, and ready to hang! I cut up a heap of foam core scraps, and students each made a building. When they were done, they used the extra pieces to either make a car, or an extra building, or some other odds and ends, such as the airplane, the sun, and the moon. The 2nd grade "James Rizzi Cars" are finally all done, so here's a few more photos. Coming soon, I'll be posting a Rizzi-style city by grade 4, and some very happy Rizzi houses by grade 3. The kids sure had fun learning about Mr. Rizzi and his fun artwork! Art + Math = Magic!! It's a trihexaflexagon! I'm SO excited! Best gift. EVER.